Hosting a Hawaiian Themed Party is always a popular way to have a get-together at this time of year whether it is for a special occasion or just an excuse to have a party. We have loads of Hawaiian Party Ideas to help you plan a party including wowing your guests with Hawaiian Decorations and Tableware as well as the all important Hawaiian Grass Skirts, traditional Hawaiian Shirts and Floral Leis. If you are hosting or attending a Hawaiian Party this year we would love to hear all about it. This is now the perfect time of a year for a Hawaiian Party. This is always a popular themed party to have for a birthday or anniversary celebration or even just as an excuse for a summer get-together. 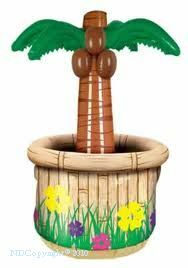 We have got loads of Hawaiian Party ideas to get you started from decorations and tableware to fancy dress and grass skirts. To get the party underway sending out hang loose invitations with floral bracelets and hairbands to wear to the party will get your guests in the mood even before they arrive. Impress your guests with vibrant Hawaiian Decorations such as Beach Cutouts, Hula Girl Swirls or Hawaiian Signs which create a fantastic effect. Glow Sticks also add to this effect when worn or Garden Glowsticks which look great hung outside on tree branches. Take advantage of the amazing Party Packs which are available to make ordering easy and there is something for everyone with various size packs available. Dressing Up for a party is always a sure way to get a party in full swing and wearing a costume for a Hawaiian Party is no exception. I always love fancy dress and feel that it gets everyone in the party atmosphere. Whether you choose a Grass Skirt and Hawaiian Shirt or a Hawaiian Hunk or Beauty Costume you and your guests will have a lot of fun. Food and drink is also another important part of the celebrations and Hawaiian Themed Tableware helps set the scene, whether you are having a barbeque or serving finger foods or nibbles our Luau or Masters of The Grill range will make clearing up a lot easier which is what everybody wants at the end of the night! Keep those essential drinks cold in an Inflatable Palm Tree Cooler and serve them in a Test Tube Shot Glass or have a nice cocktail in a Coconut Cup with a Flower Straw. A Hawaiian Lei is the must have accessory for any Hawaiian Party and we have a large selection to choose from. We all like a bargain so do not forget to check out our Special Offers when arranging your Hawaiian party. Are you hosting a Hawaiian Party this year? If so we would love to hear all about it.